Over the past several years, Historic New England restored the interiors of the Eustis mansion to reveal their original Victorian splendor. Thanks to microscopic paint analysis and meticulously hand-ground paints, the colors in the principal rooms once again appear as they did when W.E.C and Edith Eustis lived here. Historic photographs guided the furnishing of the rooms. 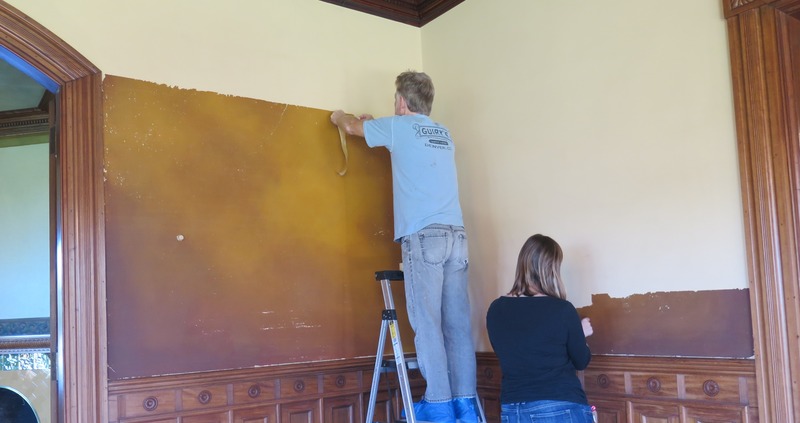 When Historic New England purchased the Eustis Estate, the walls in most rooms were painted with modern, light-colored latex paint. To learn more about the original interiors we conducted a microscopic analysis of the historic paint finishes that lay just beneath the modern paint. Not surprisingly, the original paints treatments were as stylish as the architecture, and true to the aesthetic of the day. Deep and nuanced colors were chosen to compliment the tones of the rich woodwork. Colors were highlighted with metallic paints, accentuating the spatial effects of Emerson’s architectural design. Designed to shimmer and glow on both textured and flat surfaces, the metallic paints and the deep wall colors of red, green, and amber were executed by skilled hands. 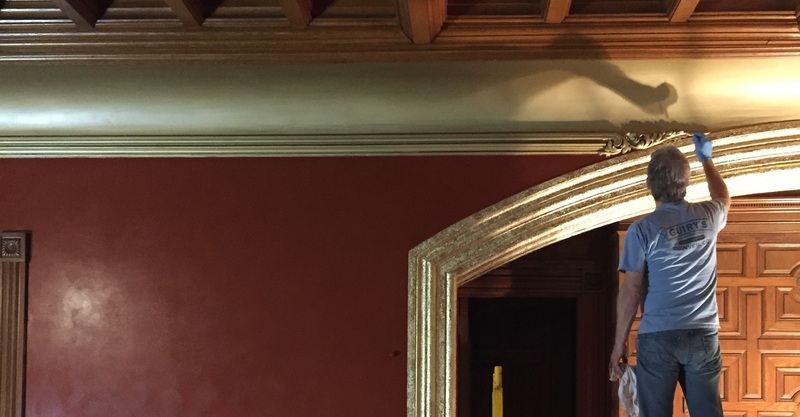 In the hall, a rich Pompeiian red unifies the core of the house. Deep, saturated colors were popular nationwide, but their treatment at the Eustis house takes them to a new and more sophisticated level. 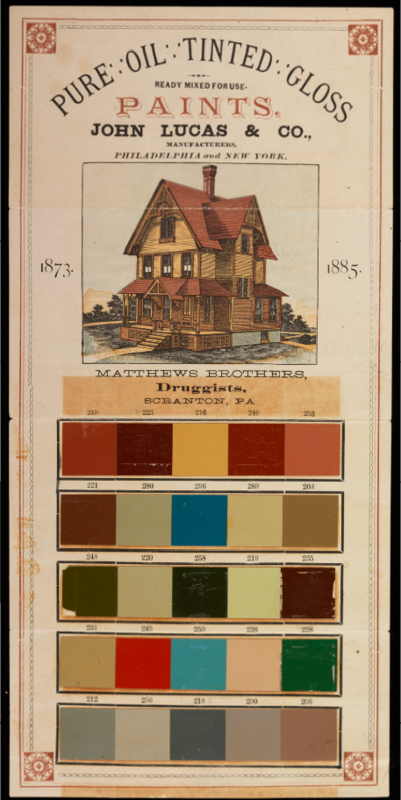 This paint chart dates from 1873 to 1885 and highlights a color palette that is almost identical to the colors uncovered in the Eustis mansion. 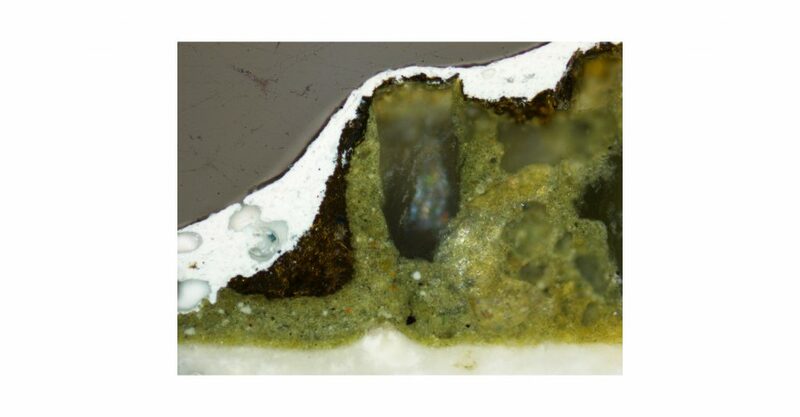 In order to discover the original paint of the hall, a deep chip was removed from the wall and its cross section examined through a microscope, revealing each layer of paint. 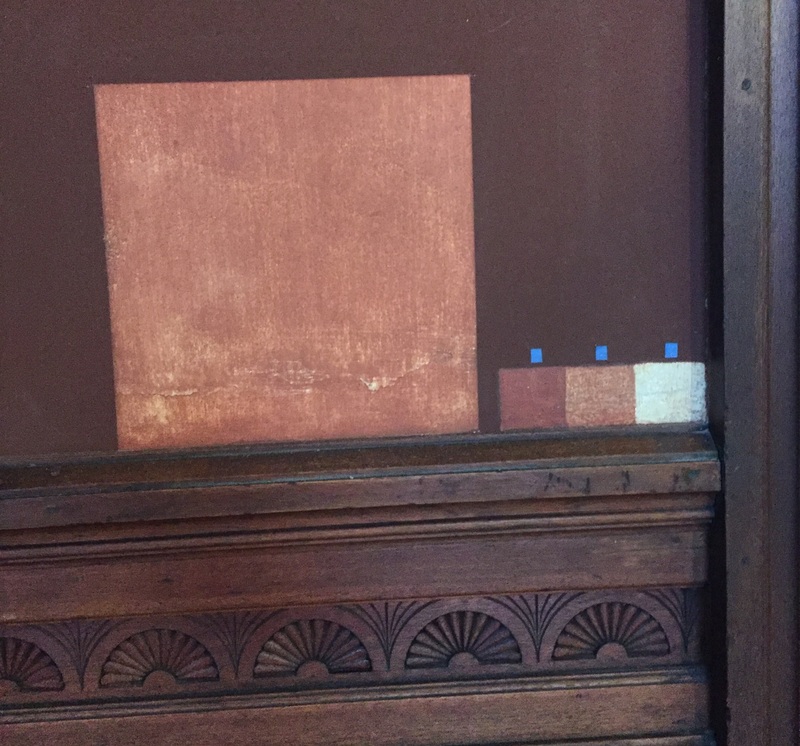 In this cross section from the hall, four individual layers of red paint were used to create the original wall treatment, followed by a single layer of modern white paint. The four original paint layers contained hand-ground pigments of various sizes, creating a depth in the color that was more like canvas painting than modern wall painting. 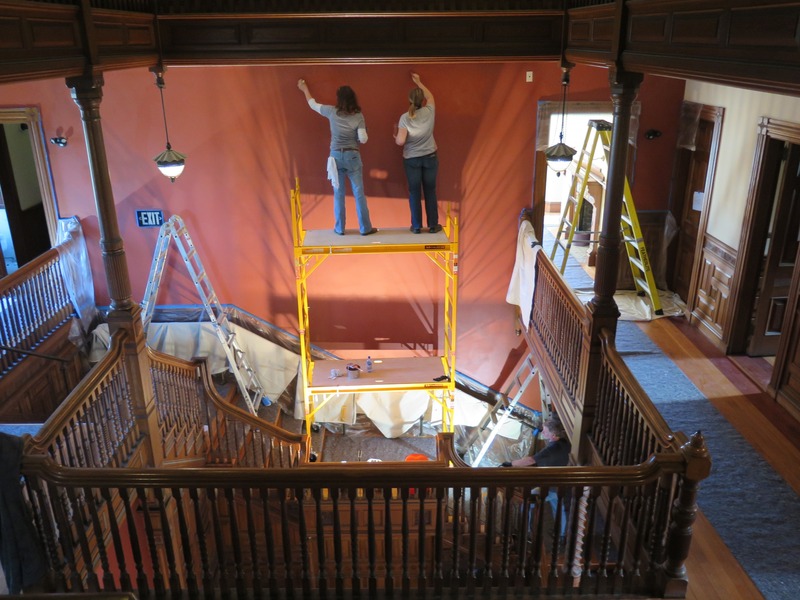 As part of the restoration of the Eustis mansion, Historic New England hired specialized decorative painters to recreate the four layers of red in the hallway, restoring it to the original Pompeiian red. Base layer of red paint. Second layer of red paint. Third layer of red paint. Top layer of red varnish. Modern white latex paint, now painted over. It turns out you really can use duct tape to fix anything! 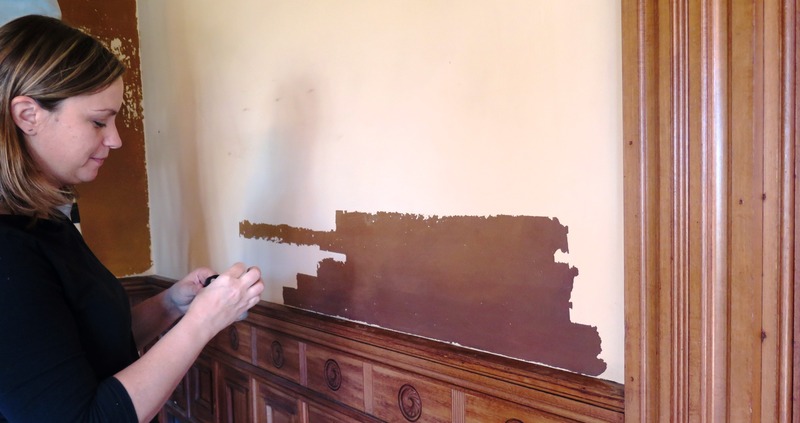 While attempting to expose a small patch of the original painted surface by picking away the top layer of modern paint, a historic paint specialist discovered that the varnish applied to the original surface created a sheer layer, allowing the 1980s latex paint to be removed surprisingly easily. 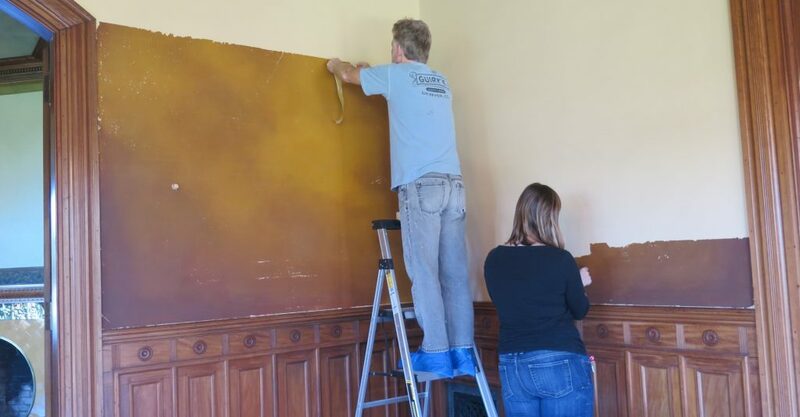 A team from International Fine Art Conservation Studios (IFACS) used duct tape to remove all the modern paint, revealing the original nineteenth-century decorative paint treatment beneath, which was almost completely intact. Members of the IFACS team then hand-painted the areas of paint loss, and finally added a new protective varnish layer on the top. 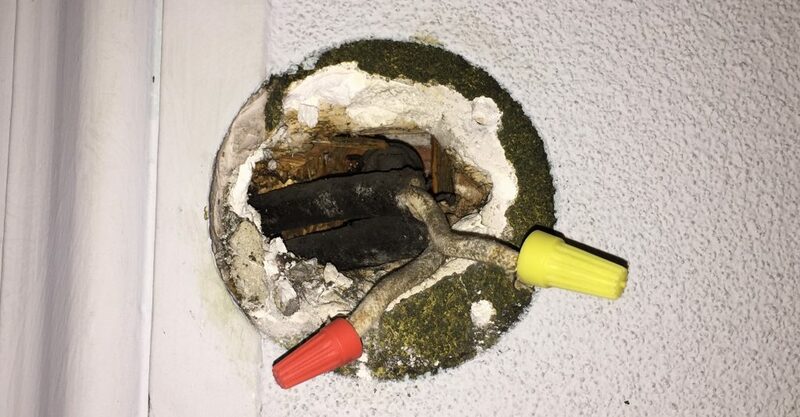 Underneath one of the sconces was a small area of original wall treatment that had been protected and was only slightly tarnished. It hinted at how dramatic the entire room once looked. By the middle of the twentieth century the walls in this room had become dark brown. 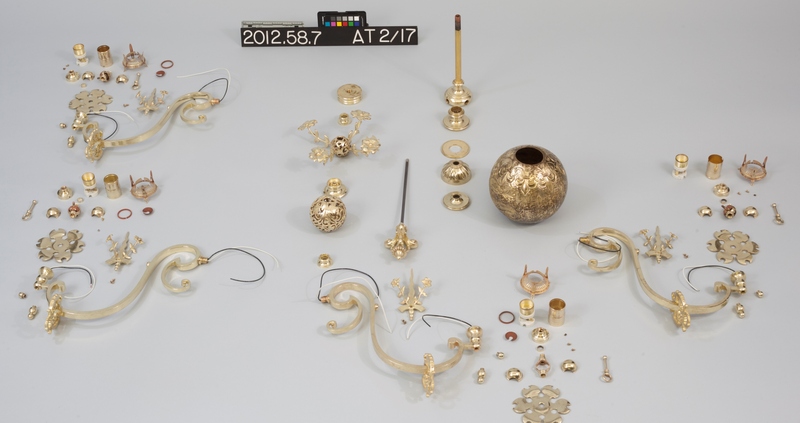 The bronze powder in the paint was badly tarnished, completely losing its gold appearance. In order to brighten the room, the family painted the walls pale blue. 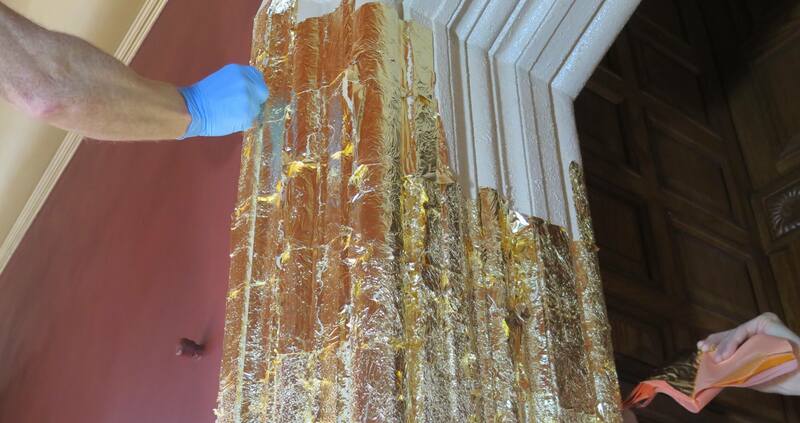 Through microscopic paint analysis of the original finish found beneath the modern paint, Historic New England determined the original technique used to create the highly textured and reflective walls. 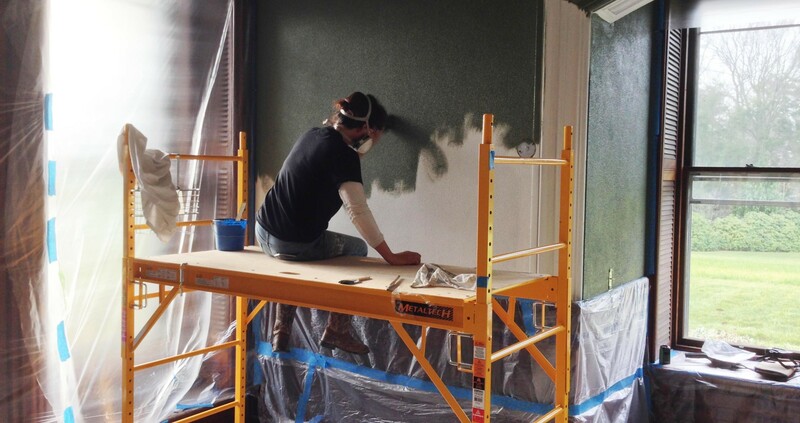 Paint analysis revealed that a base coat of dark green oil paint mixed with sharp-edged grains of coarse sand was first applied to the plaster walls. A bright gold-colored bronze powder was then overlaid to create a surface that reflected light off tens of thousands of tiny facets on the grains of sand. The broad arch framing the exterior bay windows was a less textured, more shimmering surface. The ceiling was a smooth surface composed of silver-colored tin powder on white paint overlaid with an amber toning varnish. It glowed warmly in the light of the room’s gasolier and sconces. This cross-section image shows each layer. On the bottom is the base layer of green paint with large, coarse sand mixed in. On top of that is a thin layer of the bronze powder paint, tarnished to dark brown. The top layer is the modern light blue paint that covered the tarnished bronze paint. When Historic New England conducted microscopic paint analysis in the library, we discovered an original paint color much lighter than what is currently here. We also found that the ceiling and gable ends were a light olive green color. Historic New England plans to complete paint restoration in this room in the future, but for now, paint samples on the walls present the room’s original colors and give a hint of its past appearance. The small squares reveal the wall colors during different periods. The white is the base plaster. The mottled orange is the treatment chosen by W.E.C. and Edith Eustis. The dark red and the current room color were both chosen by later generations.